Pep Guardiola’s Manchester City side are just making a habit of steamrolling their opponents as they once again ran the show and came out 6-0 winners against Shakhtar Donetsk in Manchester. David Silva opened the scoring in the 13th minute, and after that, it was just a procession as the Citizens kept attacking in waves and they looked like scoring and carving open their opponents at every move. Here is how the defending Premier League champions fared in this game. A spectator on the pitch as all the action happened on the other side of the pitch. Fumbled once but was hardly tested on the night. Usually, the English fullback is more adventurous but it was clear that Guardiola wanted him to sit back a bit in this game. Did an excellent job in plugging the gap at the back. A top class performance from the English defender as he hardly broke a sweat and dealt with everything with ease. Whether it was timing his challenges or distributing play from the back, Stones was rock solid in everything. The defender has slowly gone on to cement his place in the starting eleven, and it’s clear why Pep trusts him as he is strong and decisive and comfortable on the ball, just like today. The manager gave him the freedom to barge forward, and he played as a wide midfielder more than a fullback. Did his job well and his link-up play was worth mentioning. The Portuguese was a delight to watch tonight as he reigned supreme with his little tricks and flicks. Didn’t have that much of a defensive duty, and dominated the centre of the park when on the ball. With so many creative players around him, he just kept on giving the ball to them without any pressure. Scored the opener and is clearly becoming a goal scoring threat as well which one doesn’t usually associate with the Spanish playmaker. Once again ran the show and also won a penalty. Stretched the play from the right beautifully and set up the first goal which eased the game from there on. Wasn’t on penalty duties after his glaring miss at Anfield. Can be called as the best player on the pitch even though the penalty which he earned was a controversial one but we believe the referee should be blamed for such a decision. Scored a fantastic goal and kept the opponent defenders busy with his intelligent runs. Scored two penalties and scored a late goal by finishing well to complete his hattrick. However, it was a patchy performance overall as he was found wanting on a few occasions. Had a stroll in the park after replacing Walker. Played a useful role by setting up the fifth goal for Riyad Mahrez. Aston Villa Complete The Signing Of This American Starlet: A Good Move By Bruce? 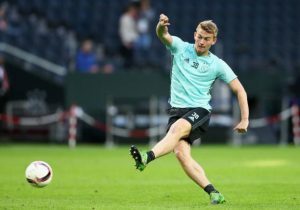 23 Y/O Wing-man To Be Offered New Contract At Celtic: Is He Now Prepared To Fulfill His Potential? Mourinho Wants Another Chelsea Player At Manchester United; Has He Lost It? Aston Villa Ready To Move For This Premier League Forward: Ideal Reunion For Bruce?